Is 0004 the latest non-k unlocked bios for Gene?? Hello, if the BIOS NON K is on Asus Z170 PRO? Why you forget about this version? Can i use the Non-K Bios for the Asus Z170 Gaming Pro for the new one Asus Z170 Gaming Pro/AURA ? Hello. Any news about non-K BIOS updating ? Hello, guys! What about mb ASUS Z170 PRO (not PRO GAMING)? Finely taking some time whit the asus m8i and a cheap g3900. I have a problem whit the bios 0001 and 0002. The ET flash 3 tool don't let me use them. 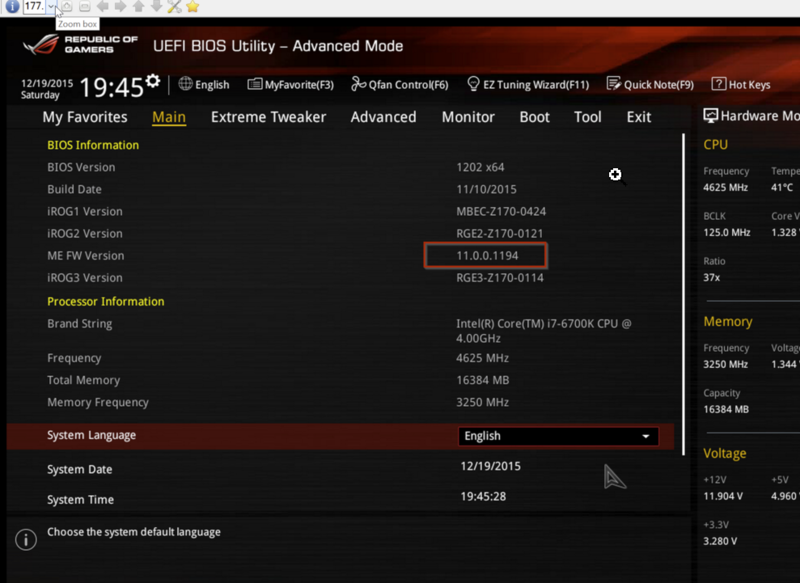 On ROG boards just use USB BIOS Flashback, it's safer than the above method. The USB bios flashback did the job. Hey, guys! I have ASUS Sabertooth Z170 S. How about bios for it? Hey, guys! I have ASUS Sabertooth Z170S. What about unlock for this motherboard? hey guy this thing didt work anymore with newbios 3007 ver. Is it possible to modify the bios of an asus maximus 9 hero z270 for the oc no k in Skylake ??? Can you check if Intel ME version got updated? Are you running the command prompt as Admin? Can you take a screenshot? Asus Z170 Pro Gaming, bios-ver: 2003. Can not upgrade bios-ver: 1301 for execute OC. I was found the selution about wrong *.cap file. having the same issue seems the newer bios have a lock to prevent downgrading. Edit: Bought a USB programmer and downgraded that way! Ok, probably an updated version of FPT is needed. Well I just downloaded the latest version of FPT(11.6), I also updated MEI drivers and all that and it still shows the 368 error. My main problem is that with the new BIOS version, boot times are a mess and also my CPU runs hotter for some reason(the voltage is all over the place even when set on manual), I never should've upgraded from 1612. Some1, please help me downgrade. Hello, I know I am late to the party, but I've got an Asus Z170-P with 6500 on it, and I'd like to try overclocking. This thing is updated to the latest 3301 BIOS from 2017/03/02, with Intel microcode updates. As far as I understand ME updates are still in the BIOS itself? Obviously I can't downgrade this version to the non-K modified BIOS, but I've bought a non-K 8001 flashed BIOS chip on Ebay and the seller was kind enough to test it for me on his own system. Now my problem is that my PC doesn't POST with the new chip installed, I've tried resetting CMOS by jumper/battery removal, starting with only iGPU, but my system just spins fans, HDD and MB led lights, monitor stays black.